In a bowl, combine the mascarpone and the remaining Grand Marnier. Mix well. Set aside. In the bowl of an electric mixer, beat the whipping cream with the sugar, vanilla extract and remaining 1 tablespoon of Grand Marnier. Beat until stiff peaks form. Take a quarter of the whipped cream mixture and stir into the mascarpone to lighten the mascarpone. Then add the remaining whipped cream mixture and fold gently into the mascarpone mixture. Set aside. Spread 1/2 of the jam mixture in the bottom of a 13 x 9-inch baking dish. The mixture will be very liquidy but don’t worry about it. The ladyfingers will absorb the liquid. Sprinkle 1 tablespoon of the lemon zest over the jam mixture. Line the bottom of the dish with ladyfingers, making sure to fill in every spot. If you have to snap the ladyfingers into smaller pieces in order to make them fit. Spread half of the mascarpone mixture evenly over the ladyfingers. 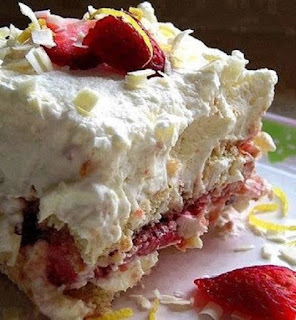 Layer half of the sliced strawberries over the mascarpone. Spread the remaining jam mixture over the strawberries. Sprinkle the remaining 1 tablespoon of lemon zest over the strawberries and jam. Create a second layer of ladyfingers over the strawberries and jam. Again be sure to completely fill in the layer. Spread the remaining mascarpone mixture over the ladyfingers. Layer the remaining strawberries on top. Chill for at least 12 hours before serving.